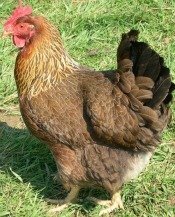 Welsummer Chickens lay very attractive eggs of a dark and deep reddish brown color and are excellent foragers. Size: Standard Male: 7 Ibs. / Standard Female: 6 Ibs. / Bantam Male: 34 oz. / Bantam Female: 30 oz. Comb, Wattles & Earlobes: They have a medium-size single comb with five evenly serrated points that are longer in the middle than the ends. The comb stands upright and the wattles are moderately long and well rounded. The earlobes are elongated ovals of medium size and they all are bright red. Color: Many breeders are now producing many color varieties, but only one has been recognized by the APA as it is a relatively new breed to North America. In the recognized variety, the beak is dark horn and the eyes are reddish bay. The shanks and toes are yellow. Male: They have a golden brown to a reddish brown head, hackle, back, and saddle. The breast and body are black with some red mottling and the tail is black with some brown edging on the coverts. The wings are reddish brown with black highlighting. Female: They are primarily reddish brown with a stippling of black or gray on some feathers. Special Qualities: They lay beautiful colored dark and deep reddish eggs. Excellent forager. The breed is relatively new to North America, though it was developed in native Holland in the early 1900's. It takes its name from the village of Welsum. The original breeder began crossing Barnevelders with native birds until he got a consistent and stable cross. These birds are known to be the top free range foragers of all egg-laying breeds. They lay a moderate number of tan to dark eggs. The hens mature early and do tend to go broody at times. The breed was recognized by the APA in 1991.